After nearly four months of waiting, the final table of the 2008 World Series of Poker Main Event concluded last night in a battle of rising poker superstars. 27-year-old Ivan Demidov had already locked up the title of biggest Russian money winner in WSOP history, and was looking to become the first Russian Main Event champ after his third-place finish in the WSOP Europe Main Event in September. 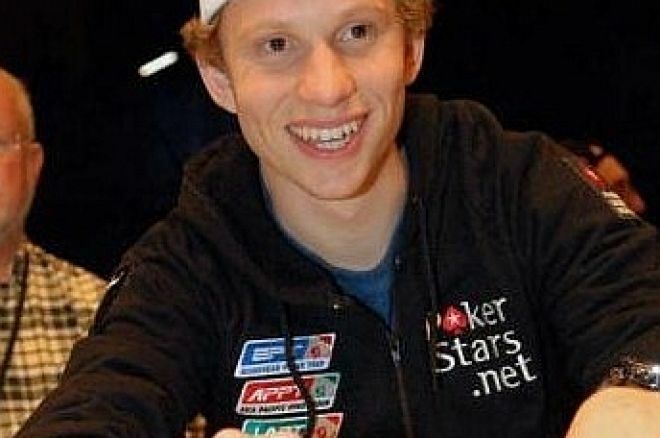 Peter Eastgate was looking to be the first Danish Main Event champ, and also had his sights set on the title of youngest Main Event champion ever, a title held by Phil Hellmuth for nearly twenty years. After a grueling back-and-forth, heads-up battle on the stage at the Penn &amp; Teller Theater at the Rio, Eastgate took the title in one last confrontation of big hands to lay claim to the bracelet and the $9,152,416 top prize. With blinds at 300,000/600,000 and a 75,000 ante, both players were very deep-stacked as heads-up play kicked off. Ivan Demidov started an early surge by calling a preflop raise from Eastgate on the very first hand to see a flop of . Eastgate fired out 1.75 million at the flop and Demidov called again. Demidov checked to Eastgate on the turn, and Eastgate checked behind. Demidov fired eight million when the landed on the river, and Eastgate thought for a long moment before folding. Action continued back-and-forth for several more hands before Demidov took over the chip lead in another big hand. Blinds had jumped to 400,000/800,000 and a 100,000 ante in a hand where Demidov raised to two million from the button and Eastgate called. The flop came down , and the players checked around. Eastgate led out with a 2.5-million bet on the turn, and Demidov called. Eastgate checked the river when the landed, and Demidov took a moment before pushing out a six-million bet. Eastgate called and mucked as Demidov tabled for a rivered two pair. That hand gave Demidov the chip lead for the first time in the heads-up match. Eastgate moved within striking distance of the chip lead slowly over the next few hands, then reclaimed the lead with a big one-pair pot. The two players limped to the flop of , and Eastgate led out with a one-million bet. Demidov thought for a moment before calling, and both players checked the turn. Demidov checked the on the river, and Eastgate led out with a bet of 2.675 million. Demidov thought for a moment before calling, then mucked as Eastgate showed for a rivered pair of nines. Back from break, Eastgate never let up on the throttle, moving over the hundred-million-chip mark soon after. Eastgate limped in from the button, and Demidov raised an additional 1.95 million. Eastgate called, and the flop came down . Demidov opened with a 3.625 million bet, and Eastgate thought for a moment before calling. Both players checked the turn when the landed, and Demidov led out for seven million when the hit the river. Almost before Demidov finished the bet, Eastgate called with for second pair. Demidov showed for ace-high, and Eastgate dragged a big pot to cement his lead. Play slowed down for a bit as Demidov picked his spots carefully to try and grab chips where he could in the face of Eastgate's lead. Finally, the dam burst and the two players collided in another massive confrontation. Demidov opened with a raise to two million from the button, and Eastgate called. Eastgate checked the flop, and Demidov checked behind. Eastgate fired out 2.5 million when the hit the turn, and Demidov raised to eight million. Eastgate called, and then checked the river when the came down. Demidov thought for a moment before betting out 12 million, and Eastgate made the call in the biggest pot yet in the heads-up match. Demidov showed for ace-high, but Eastgate tabled for the diamond flush and dragged a pot worth over 44 million. The final hand came down to big hand over big hand as Eastgate finally put Demidov away as the runner-up ($5,809,595 for second place) and claimed the bracelet. In the final hand, Eastgate limped in from the button, and Demidov checked the big blind. Eastgate fired out 1.25 million on the flop, and Demidov called. Demidov checked again when the came on the turn, and Eastgate bet two million. Demidov thought for a moment before check-raising to six million, committing half his stack to the pot. Eastgate thought briefly before making the call, and Demidov announced an all-in as soon as the hit the river. Eastgate snap-called, and Demidov tabled for a turned two pair. Eastgate then revealed his hand – for the wheel straight and the win. Peter Eastgate claimed the title of youngest Main Event champion in the WSOP Las Vegas edition, breaking the 19-year-old record held by Phil Hellmuth. He also jumped into the top five on the all-time money list with his $9,152,416 victory.